Featuring a new roof, the Jindabyne PT2270 pop-top by Jurgens is an intriguing, compact, family-friendly bunk van. When we think about family caravans, we often think of 23-plus-footers – and that’s just the body length. These vans typically have a forward bed, a rear bedroom for the kids, a rear bathroom, and everything else in between. Fair enough: this layout works well. But what might a bunk van look like when its external body length is a mere 16ft 1in? The Jurgens Caravans Jindabyne PT2270 pop-top provides the answer. The Jindabyne has been on the market for some time; however, the big news here is that Jurgens Caravans Australia has redesigned the roofs of its pop-tops. The result: one of the easiest pop-top roofs I’ve ever lifted, and I’ve lifted a few in my time. The fact the PT2270 eschews a roof-mounted air-conditioner in favour of an under-bed Truma Saphir air-conditioner helps in this regard, no doubt, but the redesigned Jurgens pop-tops roofs are a winner in my book. There are other differences, too. Unlike some pop-top roofs, the awning needs to be unrolled about 1m first, and the new roofs involve four internal clips (which resemble hooks) that keep the roof firmly closed when you’re underway, as opposed to the external over-centre catches most pop-tops employ. 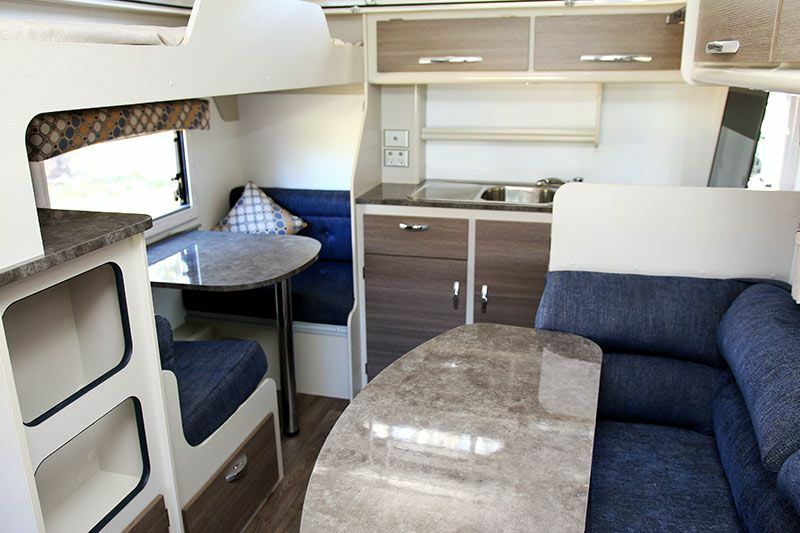 While the layout in the PT2270 pop-top has been in use by Jurgens Caravans for a number of years, it remains appealing – to me, at least. As you might expect, space constraints preclude an onboard bathroom, but it will accommodate two adults and two children, and it even has separate dining areas for both generations. How? The answer lies in the bunk bed arrangement. An upper bunk in the rear offside remains permanently setup, while underneath is a little dining nook complete with two lounge seats and a table between. In mere moments, the table’s leg can be unscrewed and stowed somewhere, the tabletop unclipped from a side rail, and positioned as a bed base, between the two existing lounges. The lounges’ backrests fill in the space. Voila, a bed for one of the kids. Now, due to a storage nook forward of the lower bed, this bed is necessarily shorter than the bunk above. The storage nook consists of an upper and lower compartments, the openings of which double as a ladder to the upper bunk. Neat. It also contains a couple of 12V and 240V powerpoints, the water level indicator, and a battery voltmeter. Directly opposite, in the rear nearside corner, Jurgens Caravans has fitted a small but nicely finished kitchen. It contains a four-burner cooktop and griller, a sink, some cupboards, a drawer and a couple of overhead lockers. Because this pop-top packs in a lot of ‘living’ features, there’s very little bench space for meal preparation. However, I noticed the adjacent under-bunk dinette table is almost at bench height, and it would make a perfectly suitable substitute. I particularly liked the ‘hidden’ storage compartment in the kitchen bench’s corner. This design is not new; however, rather than fitting a wire basket in this compartment, as many other manufacturers do, Jurgens has opted for a black tub. Also, the lid – made from the same material as the bench – fits well and is neatly edge-banded. No rough edges to be seen, and that goes for the rest of this pop-top’s cabinetry. Amidships, the PT2270 comes with a 93L AES fridge with a shelf and microwave above, and the ‘adult’ dinette. A couple of downlights are built into the dinette’s overhead cabinetry. The table, meanwhile, swivels any-which-way, making this dinette suitable for all body types. And that leaves the front bedroom. Honestly, due to the fridge, it’s a bit of a squeeze to negotiate your way to the offside of the bed. But it’s worth remembering the overall width of this van is a svelte 2.35m, or 100mm narrower than most Australian-built caravans. The bedroom has a couple of overhead lockers and a wardrobe either side. The control for the reverse-cycle Truma Saphir is fitted hereabouts, too, so you can warm up the van before getting up. It’s the little things, after all. Jurgens vans – excluding the relatively new Solaris – employ a unique construction method. The chassis is a unique bolt-together construction that is (in a good way) literally full of holes. So-called ‘lightening holes’ involve engineering principles that boil down to the strategic removal of steel where not needed, reducing the weight of the structure without compromising its strength. The ‘Duratherm’ walls, meanwhile, are a one-piece 23mm composite construction comprised of an aluminium outer skin, a high density foam core, and a ply inner wall. I know from experience that these vans can take a punch. Literally, I slammed my fist against the wall as hard as I could and the panel failed to dent. A good winter hailstorm, I suspect, would fail, too. The roof is a one-piece fibreglass panel, while the one-piece exterior-grade floor sports a waterproof coating underneath and a one-piece vinyl covering inside. Storage-wise, the PT2270 has a front boot that’s split into two separate compartments: a compartment for the two supplied 4.5kg gas cylinders on the offside, and one for general storage on the nearside. There is also external access on both sides of the van to the storage space under the main bed, not to mention a small storage bin at the rear nearside. Overall, this pop-top fares quite well on the storage front. Among the other external features, there’s the aforementioned roll-out awning, a ball coupling, and a tap mounted on the A-frame. I wondered if the van would benefit from an external shower, but ultimately decided that the lack of an external shower was no big thing, given a) the pop-top comes standard with only an 80L water tank, and b) it’s therefore likely to spend more time in holiday parks than free camps. You can option in an external shower, however, if that’s important to you. Finally, the Jindabyne PT2270 is a cracker to tow. With it’s Tare of 1407kg, it’s around 300kg (if not more) lighter than other vans of comparable size and, at highway speeds behind my old Cruiser, it posed no issues whatsoever. The PT2270 is a budget-conscious pop-top that’s all about getting a small family on the road, travelling the country and enjoying the experience. It’s geared more towards holiday park stays, rather than lengthy stints away from civilisation, but there’s nothing wrong with that. In an era where vans seem to be getting bigger and as equipped as the average mansion, I found the Jindabyne rather refreshing. It’s an easy-towing, hitch-up-and-go rig with an intriguing layout and solid build quality. Anyone with young kids – or even grandkids – on the hunt for a little family tourer would do well to take a good look.